Our cat Little Mo was definitely a summer cat, she spent all winter looking sad and curled up next to the fire and yelling at us when it rained. But as soon as the weather turned a little warmer, well we hardly see her, she just couldn't wait to get outside and lie in the sun and hunt around the bushes for little insects to play with. She never roams far from home these days, so the garden is definitely her main territory. 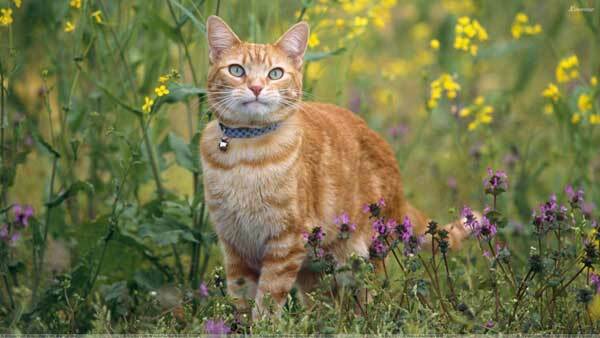 Many cat owners are worried about letting their cat outside in case they roam too far. However if you can make your garden as safe and as interesting as possible for the cat, they will have far less desire to go off in search of somewhere more interesting to play. These can be easily spilt onto the floor and picked up on the cat's fur, then when they lick them off this can cause serious illness or even death. The solution is to make sure that all spillages are cleaned up immediately and that these substances are kept in a secure box or cupboard where they cannot be easily knocked over. Also ensuring that that sheds and similar buildings are kept locked and secure at all times to prevent not only your cat but also your neighbour's cats from entering is a must. Encourage your neighbours to do the same. A cat garden should be as interesting as possible to persuade your cat from wandering too far from home. If everything they need is in their garden then they will not have the desire to go looking for adventure elsewhere. So what does your cat want from a garden? Shelter - Having lots of comfy places to shelter from either the rain or the hot sun is a must for any cat. 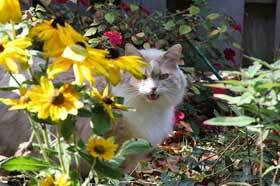 A bare piece of garden or yard will not be very appealing and when the weather dictates that a nice sheltered place is called for, your cat will wander off to find one. Cat trees or climbing posts that have a sheltered area at the top (remember cats love to climb and survey their territory from up high). Make sure you place the shelters in safe areas where the cat can see out easily and that are secluded and out of direct sunlight. Watch Towers - To make a cat garden interesting and varied for your cat, provide places off the ground where they can sit and be able to see further areas. Cats love to sit up high, it gives them the advantage of surprise against their enemies, and they feel safer and because they see more, keep them entertained longer. 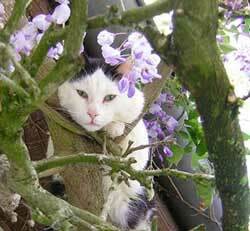 Simple perches can be attached to tress or fences or freestanding cat trees can be either bought or made. Water - making sure that there is plenty of fresh drinking water available in the garden will prevent your cats looking for it elsewhere. This is very important during the hot summer months where heat stroke can be a common occurrence. Place several bowls of water around the garden, to keep it interesting for your cat to find them. Planting - Having lots of different types of plants in your garden is great for attracting various insects to your garden and chasing and pouncing on these insects will keep your cat entertained all day long. However it is important to remember that not all plants are safe for your cat, so always check before you buy new plants that they are safe in a cat garden and not toxic. Catnip - if you have a cat that loves catnip then planting your own catnip plants around the garden will make it a paradise for your cat. However remember to plant it in areas where you won't mind the plants being trampled and laid on, as Catnip will often entice cats to roll around in it and generally flatten surrounding planting. Once you have answered these questions it is easy to transform your garden into the perfect play area for your feline friend to call their own.